When I was first diagnosed, one of the hardest things we had to face was the lack of research, resources, and treatment options for sarcomas. A couple months later, however, we came across a small event that made us smile. This event is the Dragonslayer 5k Run/Walk/Bike at Cook Park on September 12. This event means so much to me because it’s one of the few efforts fighting hard to bring awareness to the “forgotten cancer”: sarcoma. This will be my 4th time participating in the event, and it’s a huge dream of mine to bring a lot of people together to join me on Team Kick ASPS. The special thing about the Dragonslayer for me is that regardless of the condition I’m in at the time it occurs, I find a way to get myself there and participate. I’ve completed the Dragonslayer by simply walking, being pushed in a wheelchair, using crutches, having my arm in a sling, and breaking out from the hospital on a special pass from the doctors. A little ironically, I don’t let cancer get in the way of advocating and raising awareness about my cancer. This event means so much to me because it represents the way I like to live my life: Doing what I like no matter the circumstances, and living to the maximum. While doctors openly voice their concerns and doubts, or share their mostly pessimistic predictions for my future, I’m just going to keep on doing my thing. The Dragonslayer really embodies this for me. It doesn’t matter how strong or weak I am, I WILL NOT let ASPS get in the way of getting some exercise and celebrating with family and friends in Cook Park. Not to mention helping to raise money for a severely underfunded type of cancer! One of the best things about the Dragonslayer, however, is having an army of friends supporting you and standing by your side. It makes my day to see acquaintances from church, school, sports teams, and more all come together to fight for a cause that literally means the world to me.You can practically feel the love and good vibes during this event as you take in all the smiles, cheers, encouragement, and most of all HOPE. 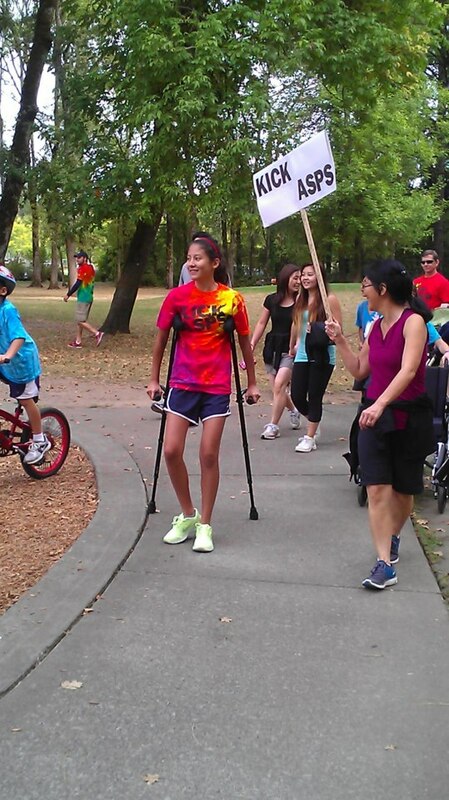 So I have one simple request: Please join me Saturday morning on September 12 as a part of Team Kick ASPS? Even if you can’t make it your registration fee will help fight sarcoma or you can donate to our team goal which we hope to direct towards ASPS research.